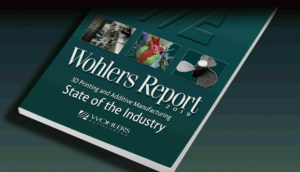 Wohlers Associates, Inc. announced the publication of Wohlers Report 2019, the 24th annual installment of its undisputed, industry-leading report on additive manufacturing (AM) and 3D printing. The worldwide study provides the “pulse” of the industry by reporting on growth, development, and the future of AM materials, applications, systems, services, design, software, patents, startups, standards, investment, and research. 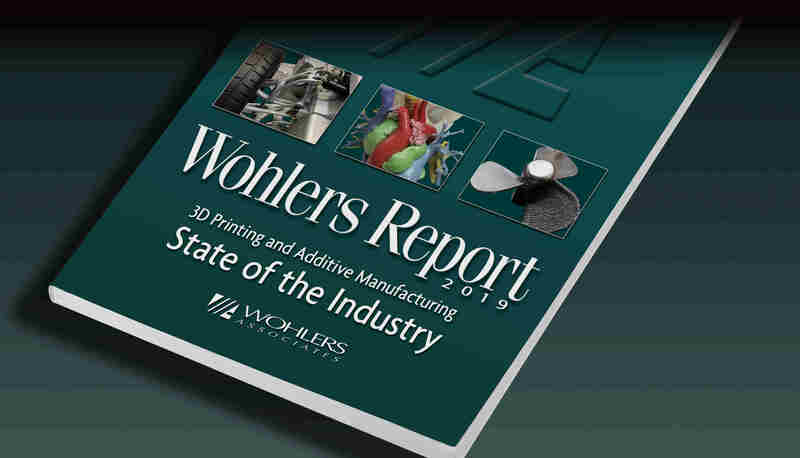 The 369-page Wohlers Report 2019 includes wide-ranging data on AM materials development and consumption. The overall materials segment of the industry saw record growth in 2018. Revenue from metals grew an estimated 41.9%, continuing a five-year streak of more than 40% growth each year. Such strong activity among materials suppliers and customers is a telling indicator of the increasing use of AM for production applications. all-time high in 2018. Figures are in millions of dollars. The report highlights notable AM-related activities in many industries, including aerospace. The team collected insights from the likes of Airbus, Boeing, Honeywell Aerospace, and United Technologies Corp., to gain perspective on using AM to produce end-use parts. These companies, along with BMW, Deutsche Bahn, FIT, Jabil, Oerlikon, UPS, the U.S. Marine Corps, and others shared emerging trends from their vantage points. Among the trends are knowledge and skills development, cyber security, post-process automation, materials development, partnerships, and industry standards. Wohlers Associates tracked growth and sales of 177 producers of industrial AM systems, which are those priced at $5,000 or more. This is nearly one third more than the 135 system manufacturers reported a year ago. While industrial system manufacturers grew notably, desktop 3D printing systems (those that sell for under $5,000) saw significant decline in annual growth. The overall AM market continues to trend upward, with many new players, hundreds of millions of dollars invested, and innovative new products designed for AM that few envisioned years ago. Wohlers Report 2019 draws upon expertise of 80 authors and contributors located in 32 countries. Wohlers Associates also received input from 127 service providers, 71 manufacturers of industrial systems, and 30 producers of desktop 3D printers and third-party materials around the world. This input and perspective combines with 30 years of data and experience accrued by Wohlers Associates to provide the clearest and most comprehensive body of work available in the industry. The company offers an unparalleled window into AM and 3D printing. The independent consulting firm of 32 years provides technical, market, and strategic advice on the new developments and trends in rapid product development and AM. Wohlers Associates counts 267 organizations in 26 countries among its clients. Separately, the company has provided advice to more than 180 investors. This entry was posted in News: Related Industry News, SCANews: 3D Scanning News by admin. Bookmark the permalink.